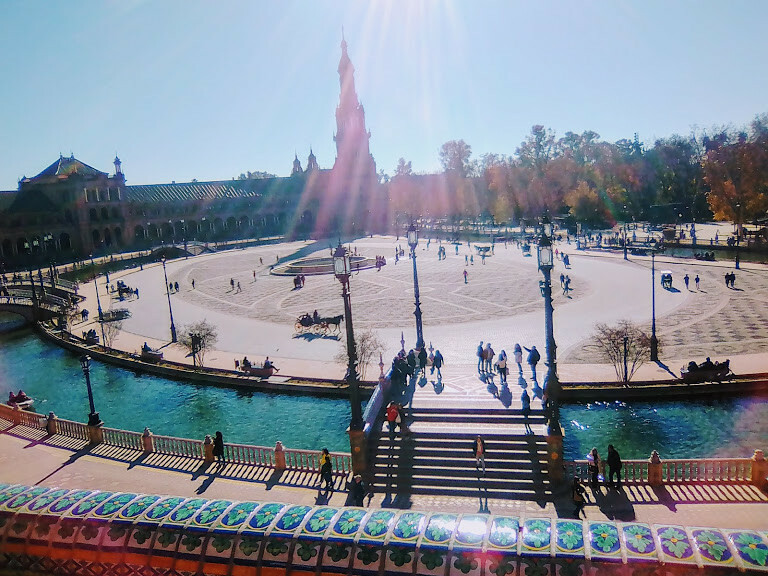 The Plaza de España is an emblematic place in center of Seville, a must see architectural masterpiece conserved until now with a very attractive view on the central part with amazing boats, fountains and horse carriage. The best way to get from Madrid or Barcelona to the south of Spain and exactly Seville is to take the train high speed for 77 euros almost or the bus for much less approximatively 26 euros but with longer distance and more duration of the trip. 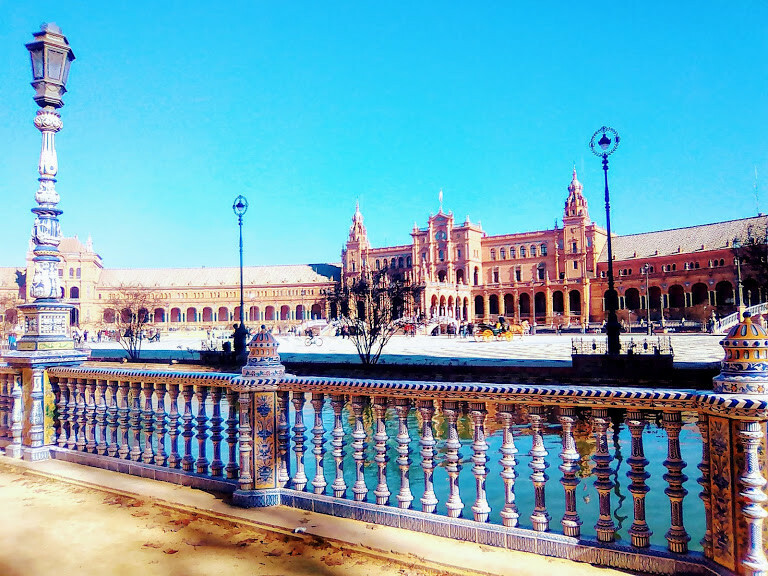 It was a sunny day full of joy and enthousiasm, i prepared my back back and took the train from Madrid to visit the most wonderful and splendid place ever, Plaza de España in Seville located in the very famous Maria Luisa Parc (Parque de María Luisa). The pavilion buildings are so large making this monument a real castle with two big wings and a central part, the most beautiful aspect is the tiled Provincial Alcoves along the walls with amazing and unique architecture and the little river crossing all the place with wonderful little boats that i had the amazing chance to try. During travels we can not only enjoy the amazing landscapes but also meet new poeple that make our trips even more beautiful and exchange with them many funny stories and experiences, i met in this amazing place two moroccan men that were very addicted to sport and one of them was previously a champion in marathon, we exchanged many wonderful conversations and we decided to try a tour in the boats toghether. The cost of half an hour is 8 euros with a limit of four persons inside the boat that we can pilote alone in that amazing and wonderful historical place full of very rich patrimoine. we had great fun to oriente the boat alone and row in very funny way while we were getting to know more each other and exchange many great experiences. after this tour, a show inside the place took place with many kids around, dancers and very unique music, the women dancers were dressed with red dresses and the man in black suits dancing toghether in harmonious way, we were actually watching the flamenco dance free in the place near the boats. Such shows can also be found in special places like for example Tablao Flamenco El Arenal or Flamenco Museum. Then at night the big fountain centering the spanich place began to show many different and beautiful colors in great landscapes drown in water. The Monumento a Cristóbal Colón which represents the Christopher Columbus Monument was centering the parc where existed a great atmosphere of relax and joy. What i like also about the city is the number of cultural buildings created to make poeple know more about this very rich culture, such as Theatre de la Maestranza, the cultural center CICUS of the University of Sevilla, the Museo de Bellas Artes de Sevilla and the scientific center Casa de la Ciencia. Many beautiful souvenirs could also be seen especially many fans reflecting the spanich aspect, many small things for one and two euros can be bought to keep the amazing souvenirs of this city. 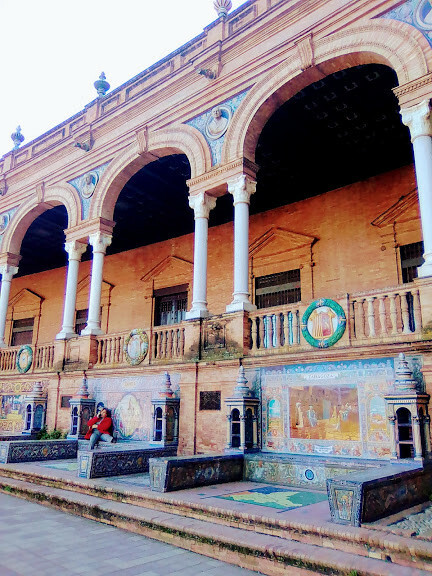 A special oriental architecture and design was used to build the arcs decorating the entry of the palace, very details colours and amazing art reflect the beauty of this place. In every arc built, was drawn a beautiful landscape of the different big spanish cities and a different province of Spain such as Valencia, Zaragoza, Madrid with maps showing their exact location and all the landscapes were designed by coloured porcelain. That amazing design can also be very well noticed in the different bridges decorationg all the castle. 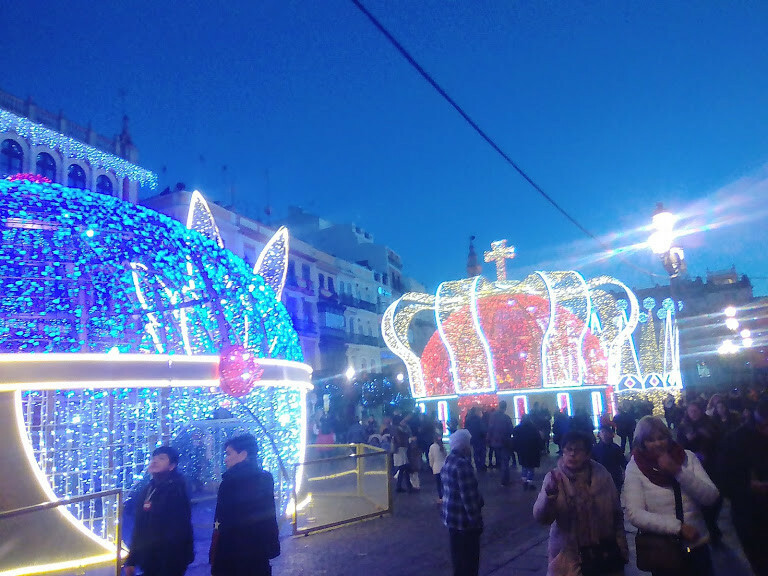 As it was the christmas period, all the streets where existed amazing shopping malls, different centers and shops were decorated with very beautiful lights of the christmas that gave to the streets a festive appearance. All the castles and the gardens inside the city were showing a wonderful landscapes of magical lights everywhere. I had a really little surprising misadventure when i was going back home but learned much lessons from it, as i was walking in the street, i dropped by mistake my money. While i was not even noticing, a men yelled at me and gave me back the amount i dropped in the ground being so honest and faithful towrds himself and poeple, i was really surprised because he could really steal the money because in the final i did not even notice that i dropped anything, but due to the big kindness and generosity of spanich poeple he had the kindness of giving me back the money which reflect the good intention of poeple but we must not always be careful about our money in general. This content has been entered in the Erasmus Travellers Competition and have earned 519 points.